interact with our speakers and other club members. Click Here to go to Tractor Friends Webpage to find additional shows by month. 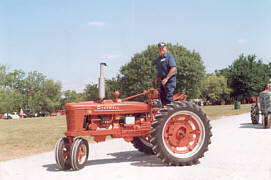 Click Here to go to Lake Country Antique Tractor Association for additional shows. 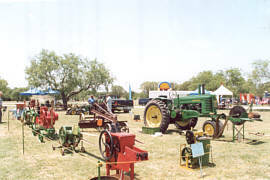 Click Here to go to Lone Star Antique Tractor & Engine Association, Inc for additional shows. Click Here for HWH 2019 Pull Dates. Weigh-in starts at 7 AM and the pull at 9 AM. Our location will be at Ben Gill Park in the city of Terrell. Texas Hwy 205 and/or about 1 1/4 mile West of Hwy 34. Musser Chevrolet, turn North and follow signs. Club members will help find a place to unload and a place to park. Click Here for the most recent show flier. Line Up in Stadium Parking Lot between 8--9:00 A.M. Tractors will form up in the parking lot for the stadium at Hwy 80 and 9th Street at 9:00 A.M. Tractors will form up at 3:30 P.M. at 1200 E. Brin. Pull in Whitewright, HWH Sled, antique tractors in AM and TTTPA hot rod pull in evening. Click on HWH Sled link above for more information. East Texas Antique Tractor & Engine Assn. Bad Weather Make Up Day 1 is May 12. Bad weather Make Up Day 2 is June 2. Meet at New York Church, 6106 CR 4334, LaRue, TX 9:00-10:00. Leave 10:00 -return 3:30-4:00. Lunch at LaRue Store. Coffee and donuts between 9 and 10 A.M. Depart for Forney at 1015 A.M. for dutch treat lunch. Return to start after lunch. Should be back about 2 or 2:30 P.M. Bring your own lawn chair to ride on a trailer if you don't have a tractor seat! Free Admission 9 A.M. to 7 P.M.
Click Here for more Texas Tractor Shows!